Rationalist Judaism: Happy 100th Birthday Daas Torah! There has always been a concept of rabbinic authority in Judaism. But the modern phenomenon of Daas Torah goes far beyond the traditional model. It extends the authority of certain rabbis into political and other worldly affairs, and it does so in inverse proportion to their experience with worldly affairs - i.e. the more that the person has been isolated from the world, the more he is said to reflect a pure Torah perspective. Furthermore, unlike classical rabbinic authority, which was expressed in terms of responsa that could be evaluated, modern Daas Torah is usually presented with no rigorous explanation or justification. Indeed, the very concept of presenting a rationale for its verdicts is often argued to be inappropriate. Modern Daas Torah also seeks to extend its authority beyond the natural communities of its various figures to the entire Jewish people. When did the modern phenomenon of Daas Torah arise, and what lay behind its emergence? The concept of Daas Torah was first informally introduced in Hassidic circles in the late nineteenth century, as a technique to reaffirm rabbinic authority in light of the modern challenge of individual autonomy. A good date to mark the official appearance of Daas Torah in the world of Misnagdim appears to be June 19th, 1914. This is the day that Agudas Yisrael, then in the process of being formed, published certain resolutions that had been adopted. The manifesto shows that Agudas Yisrael accepted two proposals insisted upon by the Hasidic rebbes as a precondition to joining the organization. One was that the verdicts of the Torah sages would be given without having to provide any justifications. Another was a considerable extension of the authority of the Council of Sages as against the lay leadership, to go beyond halachic questions. It could be claimed that Daas Torah was adopted in order to ensure that the chassidic world would join and strengthen Agudas Yisrael. But it is also argued that the concept of Daas Torah had to be developed in order to justify the very existence of Agudas Yisrael, which was a modern political structure, and, perhaps more importantly, to render it superior to other Jewish organizations—in particular, Zionism and Mizrahi. Others suggest that the strengthening of the role of rabbis in non-Torah decisions at that time may have been a reaction to the Zionist approach of restricting rabbinic authority to laws of kashrut and similar such narrow provinces. Whatever the cause, the modern Daas Torah phenomenon has certainly had a powerful impact. In the last ten years, however, it has been seriously threatened by the emergence of the internet. The internet enables people to give voice to their challenges of its pronouncements - and to their challenges of its very claim to be the traditional model of rabbinic authority. It will be interesting to see where the modern phenomenon of "Daas Torah" goes in its second century. $335.34 on Amazon for The Politics of Tradition: Agudat Yisrael in Poland, 1916-1939? Anywhere else to get it? I bought it a few years ago for 50 shekel. "But it is also argued that the concept of Daas Torah had to be developed in order to justify the very existence of Agudas Yisrael, which was a modern political structure, and, perhaps more importantly, to render it superior to other Jewish organizations—in particular, Zionism and Mizrahi. Others suggest that the strengthening of the role of rabbis in non-Torah decisions at that time may have been a reaction to the Zionist approach of restricting rabbinic authority to laws of kashrut and similar such narrow provinces." Bingo. Rav Slifkin, take a cookie. But, I don't think that the development of Daat Hatorah was a reaction just to Zionism/the mizrachi movement. I would add the Bund as well. After the impact of the haskalah, for the first time in a veeery long time, Jewish communities saw not only a fundamental split in rabbinic leadership (Zionist vs. non-Zionist/anti-Zionist) but the rise of non-rabbinic foci of power, such as the Bund and other secular movements. The haredi (Hasidic & Litvak) response was to circle the wagons & vastly expand the scope of rabbinic authority so that anyone opposing expanded rabbinic authority was now opposing God Himself. Well in light of the first reports that the kidnappings are being blamed on the Israel's government's position I'd like to note the date of this proclamation and claim that it caused World War I and all its consequences, including those 30 years later. You mean to say: "claim that is WAS caused by World War I". Perhaps there is too much importance placed on the intellectual and political side of the daas Torah phenomenon? Yes, the recent information revolution which broke-up the linear top-to-bottom authority flow has a significant role to play, but Temujin would wager that there is a much more powerful correlation between available funds and extent of authority. A comparison between the self-supporting establishment in the Galut and the situation in Israel, where a certain amount of guaranteed income and political preferences have been in place might yield interesting observations for this hypothesis. The Baal HaTanya famously complained about constantly receiving questions for advice on matters that had nothing to do with Torah . . .
R. Ron Yitzchok Eisenman, "The Short Vort- Who is Eliezer? 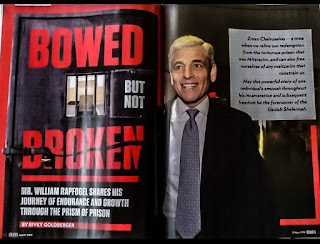 (10/25/13)"
" This proper balance between respect and reverence coupled with the recognition that even Gedolim are not infallible was recognized by all and it did not diminish their greatness one iota. Over the last twenty years this balance has been lost...This overinflated claim of near perfection and infallibility of the Gedolim I believe is not only incorrect it a major cause for the alienation of many Jews; both those who were brought up frum and especially for those who were not." "the more that the person has been isolated from the world, the more he is said to reflect a pure Torah perspective"
The whole piece is over simplistic. The only reference to the many Talmudical counterexamples is this unsourced and probably untrue effort to make a distinction between those times and these. The honest truth is that religious and lay leaders have been in tension since the days of korach and Moshe; noson and Dovid; Isaiah and tzidkiyahu; Shmuel and the resh galuta. The alternative to religious leadership is quite often the oligarchy of the rich and powerful. If there is a valid point to be made about daas Torah, it is that the pressures of orthodoxy have ironically made it much harder these days for Israeli charedi leaders to honestly say what they think. "The alternative to religious leadership is quite often the oligarchy of the rich and powerful." Except for the chassidic world, and parts of the yeshivishe world where the religious leadership and the oligarchy of the rich and powerful are one and the same. Agreed (both now and in the past cemented with marriage alliances). And nowadays there is a very attractive alternative to theocratic rule which isn't nepotistic - democracy. I just have a more nuanced view on what exactly is new about the situation today (in my view globalisation and political participation has led to a repression of critical thinking and dissent on the part of individual rabbanim). 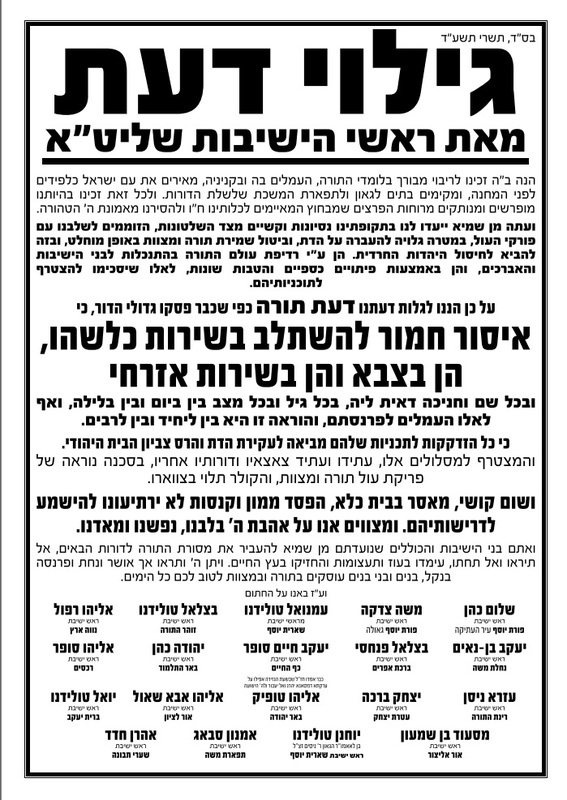 "Amidst everything we do, we say Hashem, please help our soldiers bring our boys back home." May I suggest that we let Hashem choose how to bring the boys home; whether through the IDF or not. Since Hashem acts through those who make a physical hishtadlut (otherwise we would have open miracles today), and since the IDF are the only ones so doing, asking Him to help the IDF is not an unreasonable request. "But it is also argued that the concept of Daas Torah had to be developed in order to justify the very existence of Agudas Yisrael, which was a modern political structure, [...]"
I don't understand this assertion. Why might one need the concept of Daas Torah as a prerequisite to having a religious political party. If one does, how does that fit with Religious Zionist and Da'ati political participation. Please explain? Thanks for the post on daas torah. Very interesting and I must admit I myself have major problems with the concept of daas torah. But how do you understand the parasha of Korach? What mistake did Korach make with his claim of kulam kedoshim? Is that a serious question? Are you familiar with the concepts of "kehuna" or "nevuah"? What possible relevance do you think these concepts have to da'ath Torah? Great post. And it is 50 years, a yovel, since Agudath Israel of America, officially introduced Daas Torah to America, in the second edition of the Jewish Observer in October 1963. DT is on the fringe of prophecy, it was written. That month the NY Yankees were swept in 4 games by the Dodgers in the World Series, and the next month, President Kennedy was assassinated. My only quibble with the post is whether we should say Happy Birthday DT. That is because DT is now dead, just like Shabbatei Zvi and other false movements. Nor should we light a yahrtzeit candle, a sign of honor. Let's share ideas on how we can celebrate the demise of daas Torah. It is very much alive and kicking, even if not in your part of the world. From what I've seen its somehow or other managed to infiltrate the anglo-not-quite-chareidi community, and if it can survive there it must be quite a distance from its death throes. But like almost all other trends in Judaism it will eventually merge with other ideas, mutate, or die out. Definitely not dead. How many people have had conversations with Haredim where the person says, "Oh yes, your arguments make perfect sense, but the Gedolim say otherwise and we must submit to their superior wisdom." I would like to point this discussion to Rabbi Soloveitchik's hesped on Rav Chaim Ozer where he strongly explains the concept of rabbinic leadership in ALL areas of life including political. It seems that the Mizrachi agreed with this position. RNS did you ever read that hesped? Its in Divrei Hagut V'Haaracha. Read it and weep. Rabbi Aaron Rakeffet gave a series of nine shiurim on the topic of Daas Torah. You can find them on YUTORAH starting in February 2012. He explains that the Rav completely changed his mind and he (R' Rakeffet) was quite upset that people quote the hesped despite the fact that the Rav completely reversed his position. R. Ploni. The Rav gave this hesped when he was a member of the Agudah, Later he left the Agudah and joined the Mizrachi. He changed his mind about DT, as he changed his mind about many things. .Moreover, it was not just R. Rakefet who stated that the Rav changed his mind about DT, Rav Lichtenstein did so as well. I have not read it, so I can't comment. What we do know is the Rav held that issues of territorial compromise in Israel should be handled by the experts. That doesn't sound like Daas Torah, or it if it is, it is one that has the Rabbinic authority recognizing the scope of his expertise. I'd also like to see where the Rav writes that one must defer to a self-selected or otherwise specific set of Rabbis as their authorities regardless of their community who can then issue edicts without the accompanying halachic reasoning. Finally, the Rav's opinions themselves undoubtedly did not align with Daas Torah. Do you think that he was recommending that his own opinions on halachah and otherwise be disregarded? That would be quite odd. I came across a note on the Net which had been submitted by Mark Steiner on October 30, 2002. I found it very interesting and I decided to share it with my readers. Last week (on the Yahrzeit) I heard a talk by Dr. Ephraim Shach, Rav Shach's son, during which he discussed the famous "rabbit speech" in which Rav Shach zt"l raised the rhetorical question, "in what sense are people who eat rabbits, don't know what Yom Kippur is, etc., Jews?" This speech of course aroused much opposition in Israel, but, Dr. Shach said, two kibbutzniks from Ein Harod were listening to the speech on the radio in the kibbutz barn, and what Rav Shach said made so much sense to them that they decided to leave the kibbutz and go to learn Torah in a yeshiva in order to be Jewish by more than birth. When they went to see Rav Shach, and informed him that they were leaving Ein Harod, he asked them whether they had parents in the kibbutz. One of them answered that he had an elderly father there. "In that case," answered Rav Shach, "you can't leave the kibbutz. Try to keep as much as you can of Judaism while living there." When Rav Shach passed away, and Ephraim was sitting shiv'ah for him, an ultra-Orthodox man, with black suit, hat and white shirt, came to see him. "Who are you," asked Ephraim. "I'm the father of that boy in Ein Harod," the man replied. When I heard what your father told my son, I was so impressed by the morality of Torah that I decided to leave the kibbutz myself and learn Torah too!"